A community has come together to give a historic theater a much needed face lift after it sat vacant for decades. CLEVELAND — A community has come together to give a historic theater a much needed face lift after it sat vacant for decades. Businesses are slowly coming back to the Collinwood and the street is starting to thrive again. "It's like the Phoenix rising from the fire," said Councilman Mike Polensek. 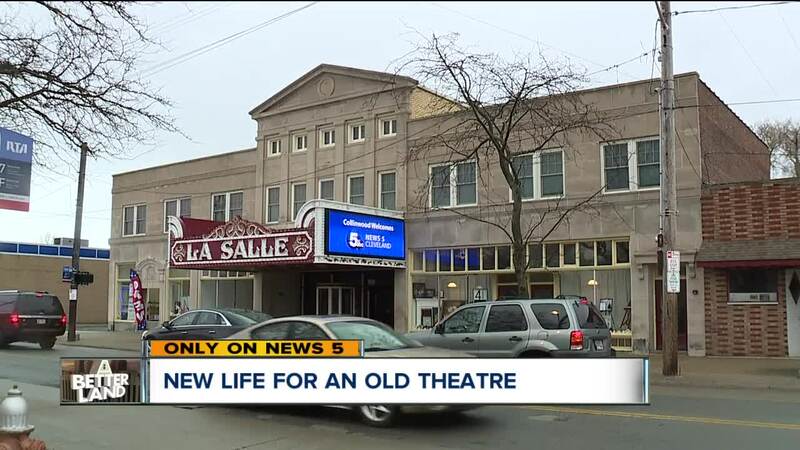 The La Salle Threatre recently got a $4.7 million face lift after several organizations came together to save it. "We're talking about some state dollars, some federal dollars, historic tax credits both at the state and federal level, private investments through different grants," said Jamar Doyle, the executive director of Greater Collinwood Development Corporation. Although the old projectors from the 1920s are still inside, it's not going to function as theater, instead it's a media arts center and event space. Councilman Polensek fought for the spot to become a historical landmark. He has so many great memories from there. "Every Sunday I was here for the matinee and my claim to fame was four weeks in a row coming to watch Sean Connery in 'Gold Finger'," he said. Now that the LaSalle is back, businesses are starting to return, like Humphrey Popcorn. "I think the renovation and the environment here in the neighborhood is very friendly," said Humphrey Popcorn's event coordinator Sarah Hall. Doyle says building this corridor back up was the plan all along. "We're seeing the theater start to encourage new business development right here and its beginning to branch out," he said. This story is part of A Better Land , an ongoing series that investigates Northeast Ohio's deep-seated systemic problems. Additionally, it puts a spotlight on the community heroes fighting for positive change in Cleveland and throughout the region. If you have an idea for A Better Land story, tell us here .